Steve Kinniburgh was pleased to see his Corby Town team put some smiles back on faces after a tough week for the club. The Steelmen were left devastated after their Steel Park home was broken into twice in the space of two days last weekend with items being stolen and thousands of pounds worth of damage caused. Volunteers have been picking up the pieces ever since but the home clash with Aylesbury United went ahead as scheduled and Corby produced the goods as they bounced back from two successive defeats with a 3-2 victory. And manager Kinniburgh took the opportunity to offer his thanks for the support the club have received ever since the break ins. “It’s the lowest of the low to be honest, people coming in and doing that to any house, business or football club,” the Corby manager said. “We have many volunteers who spend hours and hours here and get the stadium and pitch looking the way they do. “Everybody was down on Monday and Tuesday but the reaction we have had from the local community and the football family has been tremendous. “When everyone pulls together like they have done, you want to go out and perform on the pitch for them and I thought we gave them a good game. “The spirits were down because of what happened and we have got to go and repair that damage. “And if it wasn’t for those people who have come and offered to help then it would have been a bit of a struggle because there was thousands of pounds worth of damage. “We have had great support and it is still coming in and I have just got to thank everyone for that. It wasn’t all plain sailing on the pitch as Corby squandered a 2-0 lead in the first half. Jordan Francis and Elliot Sandy were on target before the visitors struck back to go in all-square at 2-2 at the break. 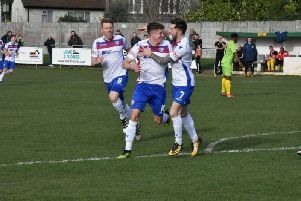 However, Sandy’s second goal of the game just before the hour mark proved to be enough to keep Corby in third place in the Evo-Stik League South Division One Central, five points behind new leaders Peterborough Sports. Kinniburgh added: “We went 2-0 up and were looking really comfortable, the shape was good and the way we moved the ball about for the two goals was excellent. “And then we had a crazy few minutes where we have allowed them back into it. One of them was from a set-piece which was a shambles and then there is a ball over the top. “But we came out and controlled things in the second half. We got the goal and we got over the line. Corby are back in league action next weekend when they head to Berkhamsted.